The other day I read a tweet about 21st century classrooms looking like Starbucks coffee shops and I couldn’t help thinking about all the wonderful classrooms I have visited or have set up myself over the thirty plus years that I have been teaching. This is not a new 21st century concept. The importance of the learning environment, often referred to as “The Third Teacher”, was brought into awareness in the 70’s through the schools of Reggio Emilia, which focused on creating beautiful places and spaces for young children to play and learn in. I think many educators would agree that classroom environments in which children live and learn have profound influence in helping them develop important skills, attitudes, and behaviours. Have you ever stopped to really identify, discuss, and unpack the big ideas behind your classroom organizations, structures, and systems? It’s more than just bringing in a comfy couch, tables, and one or two plants. 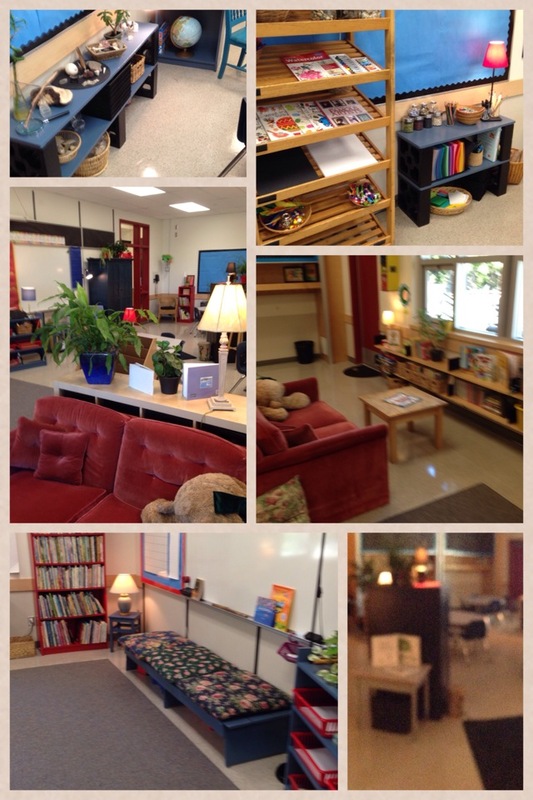 What are the beliefs and principles behind your classroom setup, furniture, and routines? If one of my goals in educating children is to help them grow into caring, thoughtful, and reflective human beings, individuals who will be better able to face the challenges of today’s society, I need to look closely at the “life” I have my students living in the classroom; it is this life which will translate into their lives outside the schoolhouse door. I am not referring to the curriculum content or activities that I plan, implement, and have students learn and do – I am referring to the ways in which I organize and invite children to interact, work, and learn together. I believe that in many subtle, and sometimes very deliberate ways, teachers both promote and prevent the development of the moral self, as well as the development of important skills, such as self-direction and regulation, problem solving, collaboration, and independence. If we don’t take the time to examine and question how we invite and expect children to live and learn in our classrooms, we may be fooling ourselves that we are making a difference. When I think of the many classrooms I have visited or have had, there are typically two kinds of environments; let’s call them two diverse classroom organizations. The first is a more traditionally structured environment, I will call the “by myself, don’t talk or share” classroom. The second classroom organization is a setting which invites children to make choices, share materials and ideas, and interact freely; I will refer to this as the “community, let’s choose and share” classroom. In this classroom children are assigned to desks by the teacher and expected to sit and remain in these seats for most of the day. The assignment of desks is more often than not based on children’s strengths and weaknesses and is a way of managing children’s behaviour. The “noisier” children are seated next to the “quieter” ones; the independent task workers are seated next to the “slow to finish” ones. Other students who may be deemed “very needy” are either seated at the front, near the teacher’s desk, or right up against the teacher’s desk, and sometimes these children are even isolated to a corner of the room. Boys are seated only by girls. 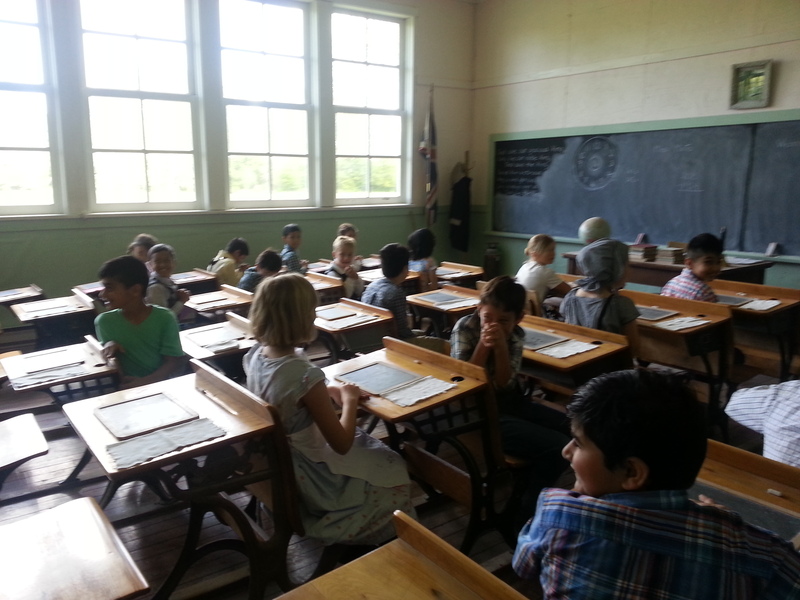 ‘English As A Second Language’ learners are seated only by English speaking classmates, and so forth. In this classroom, children are responsible for their own supplies. Their pencils, erasers, crayons, and such, are stored in their individual desks. When their materials are either used up or lost, they are responsible to inform their parents that they need more. The expectation in this classroom is to take care of and use your own things. In this classroom, there is the expectation that you use your own ideas. In other words, when you are working on a task, you are working silently and independently. In the “by myself, don’t talk or share” classroom you can often hear the teacher’s voice loud and clear: “Please, stay at your own desk”, “No, talking”, and “Thank you for doing your own work”. The voices of the students are few, but when they can be heard their words often reflect the rules of the classroom: “Please go away and don’t bother me”, “That’s my pencil”, “No you can’t use it” and “Teacher, he’s copying my work”. In such a setting, I wonder what attitudes, skills and behaviours are being taught and learned, and how might this classroom organization promote or preclude moral development? cooperation and collaboration? self-direction and regulation? In this classroom children move freely and interact with their peers. There are a variety of workspaces and table arrangements for children to choose from. The expectation in this classroom is that children will learn to make responsible choices about where and whom they will sit with according to the task or activity, and their own needs and interests. In this classroom, children’s supplies are either stored at a central location in the room or in various baskets and totes throughout the room on the tables for the children use. There are always more than enough sharpened pencils, erasers, felts, and the like, for everyone to use. No one needs to worry about finding a pencil, nor sharpening one, doing without, or having to borrow. The expectation in this setting is that students treat the classroom supplies with care and respect. Everyone is responsible for keeping the materials in order and cleaning up. While learning in the “community, let’s choose and share” classroom, children are encouraged to work quietly, and thoughtfully, sharing their ideas, helping others, and cooperating on tasks. If an individual needs, or prefers to work alone, there is always the choice to do so. The voices heard in this classroom are many and varied, but nonetheless they all work to reflect the classroom goal of respecting and caring for one another. Community supplies – everyone has what they need. No time wasted looking, wanting, and asking for in a classroom that shares materials. It’s more than just a table that allows children to work together to create and problem solve; it’s the pedagogy behind the task. Students make choices about where and who they will work, helping them become self-directed and responsible. There is no pre-determined seating arrangements; where children sit to work is always changing to meet the needs of the learner, and task criteria. The stage is set, but what does it mean? When I establish conditions and expectations in my classroom that reflect my beliefs and values about learning and teaching, and focus on how children learn to work together and build relations, I can begin to help my students become caring and ethical people, self-directed and thinking learners. Even though at times I am overwhelmed with the responsibility of guiding and nurturing my students’ moral development, it is my belief that if we do not provide these opportunities for children to see and talk about caring relations, and to struggle and reflect on their choices and behaviour, it will never happen. I can not suppose that the conditions I establish can ever guarantee moral, self-directed, thoughtful behaviour, but neither can I disclaim that I have no responsibility for my students’ behaviours and the fact that I will inevitably affect their lives. It is my opinion that the “by myself, don’t talk or share” classroom works against the very things that may help children develop important life skills, and moral behaviour. Some would disagree, defending such classroom organizations as successfully meeting curriculum standards and promoting children through the grades. In staff rooms one can hear comments: “I have a great bunch, they work so quietly”, “This year’s class is so easy to control and manage, we’re already on Chapter 27 in our math book”, “Ever since I moved Tommy away from the window, he’s been able to listen and do his work”. This makes me wonder what are these educators’ priorities? We need to listen how we value what goes on in our classroom and begin to critically examine how the lives of our students are being constructed through instructional practices. I do not mean to suggest that by simply creating a “community, let’s talk and share” classroom, all children will become more caring, respectful, responsible people. It’s not that simple. Nor do I mean to suggest that in other settings children never have opportunities to develop into caring and responsible individuals. I am suggesting, however, that classroom organizations have important influences on our students’ moral, emotional, and intellectual development, and that it is our responsibility to think about and question this hidden curriculum and evaluate how it reflects on and shapes our growing understanding of how it “plays-out” through the day-to-day life of the classroom. Previous Why is my kid building patterns again? The Importance of Patterning. I believe it is very important to share ,to be able to see the variants and to choose according to what when and where the learner experienced the situation! So as teachers I believe that we need to motivate learners to be creative-sometimes with leadership, sometimes on their own!But it is vital to discover through learning and be able to apply through self discovery! HI Kelli. I am a teacher in Surrey and I am moving towards this type of classroom this year! It’s been 3.5 days of setting up this past week or so. 🙂 My question for you is how do kids enter the room in the morning and how do they choose where to go? What happens if “Joey” always runs to the same big bean bag chair that everyone wants a chance to use? I am trying to figure out the logistics of this and how we start the day and move throughout. Thanks. This was happening in my class. As a class they decided that wasn’t fair so they’d came up with some guidelines. We have Daily 5 and Daily Math every day, so it was decided that the groups that are in areas to self, during Daily 5, and the groups working on multiplication during Math have access to the bean bags. For the rest of the day, it was decided we draw names first thing in the morning (5-6 depending on if it’s a full or short week) – these students can sit in that area if they choose. It’s been working out great – everyone is respecting the guidelines and each other. With flexible seating students have been realizing where they work best and whom they work well with. For the first few weeks I wanted to make sure students were getting to know each other so when they arrived they’d find a puzzle piece (usually theme based ie. animal with their adaptations or habitat). They’d have to find their matching piece (usually the person next to them) and this was their partner for the day(s) (who they’d be sitting with, for their turn and talk partner etc.). In doing this, students got to try different work areas in the room and they got to meet their classmates. Now they sit where they like with who they wish and it is working well. I really enjoyed this post! As a new teacher going into the field, I definitely want my future classroom to instil the sense of community in students and foster that value too. My only wonder for this classroom set up is about the occasional students that take advantage of this community system and the sense of entitlement that the students can have. Is there a way to set clear expectations around this?